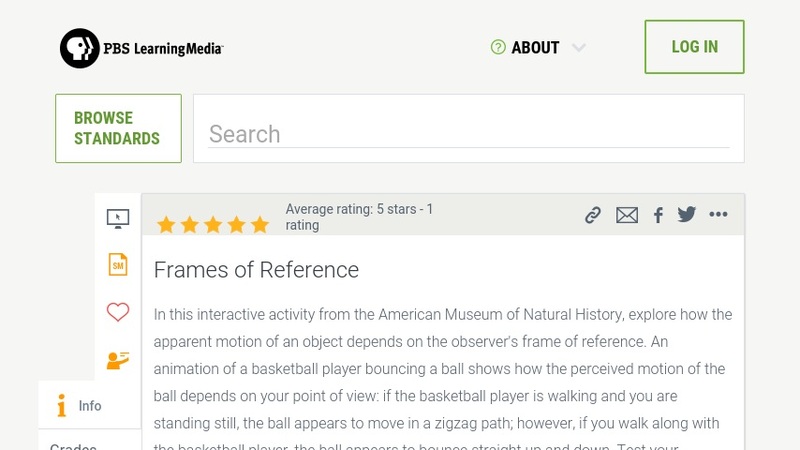 In this interactive activity from the American Museum of Natural History, students explore how the apparent motion of an object depends on the observer's frame of reference. An animation of a basketball player bouncing a ball shows how the perceived motion of the ball depends on your point of view. Students set their own pace as they view nine scenarios and respond to questions. Teachers will also find background information on the topic of reference frames, AAAS Benchmarks cited, and printable questions for classroom discussion. Item is appropriate for grades 7-12. Teachers' Domain is an NSF-funded pathway of the National Science Digital Library (NSDL). It is a growing collection of more than 1,000 free educational resources compiled by researchers and experienced teachers to promote the use of digital resources in the classroom. Editor's Note: See Related Materials for a 7-minute NOVA video on Einstein's Theory of Special Relativity that nicely supplements this animation.